I painted this piece for #Inktober and Dia de Los Muertos. I had originally wanted to call this the Book of the Dead meets the Day of the Dead (Dia de los Muertos) but that seemed like a mouthful. And as I worked on it, I began to feel like the piece was more than just a mashup of the two traditions. In this scene, Ani (a nobleman from Egypt in the 19th Dynasty – 1250 BCE) is escorting Catrina (see La Calavera Catrina) to the weighing of her heart. The god Anubis presides over the scale that measures the weight of her heart to that of a feather. O my heart of my mother! O my heart of my mother! O my heart of my different forms! Do not stand up as a witness against me, do not be opposed to me in the tribunal, do not be hostile to me in the presence of the Keeper of the Balance, for you are my ka which was in my body, the protector who made my members hale. Go forth to the happy place whereto we speed, do not make my name stink to the Entourage who make men. Do not tell lies about me in the present of the god. It is indeed well that you should hear! I’m going to be with you. 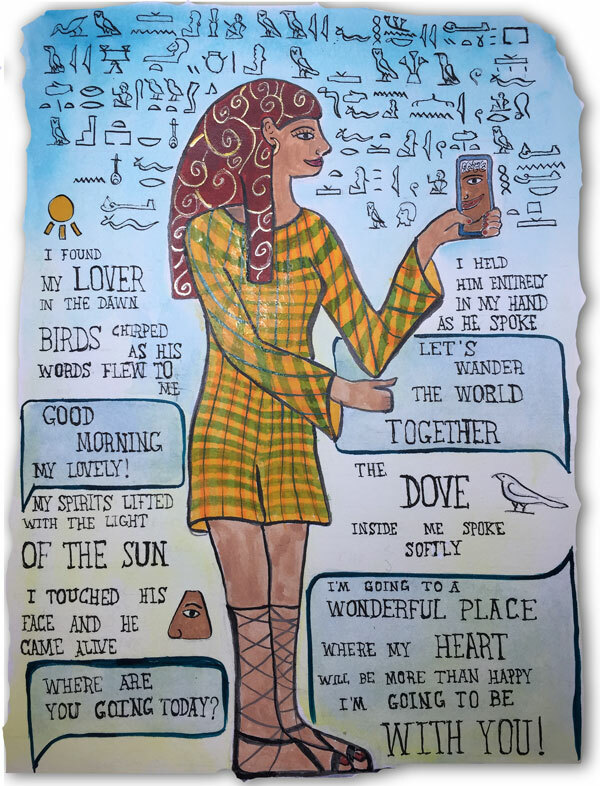 I was inspired by the poem of the Birdcatcher’s Daughter from the New Kingdom poem (or song) found in the Papyrus Harris 500. A great source for the Egyptian text of this poem and many others is Love Songs of the New Kingdom and The Literature of Ancient Egypt. Concept illustration that I made for a short story about a girl that responds to an ad about a correspondence art course and ends up on a whirlwind tour around the world. I found this wonderful piece in the historic conservatory of the One Sansome Street building in the heart of the San Francisco financial district. It is one of the many pieces by Stirling Calder (Alexander) created for the Panama-Pacific International Exposition. We took the kids to the Open House at Cloverleaf Ranch in Santa Rosa. They had lots of fun. I even had fun sketching this view of their barns from the pool. I finally got the chance to sketch the giant Medusa head that’s been lurking behind wind-screens and barbed wire fences in the heart of Petaluma, California. Before I set to work, I had a chance to meet the wizard behind this creation, Kevin Clark, a local artist known for his restaurant designs and the Rhino Redemption art car. He graciously gave me a tour of his workshop and a detailed explanation of what this giant Medusa head really was. It’s actually called Medusa Madness and it uses over 100 gallons of propane in full fire-breathing mode. The snake bodies were made from over 800 steel barrels in construction and the face was based on a mold he took from his wife face.